Today I'm going door-to-door - the real door-to-door, on foot, knocking - not my mobile version. And I'm going door-to-door trying to get residents to agree to put yard signs up. 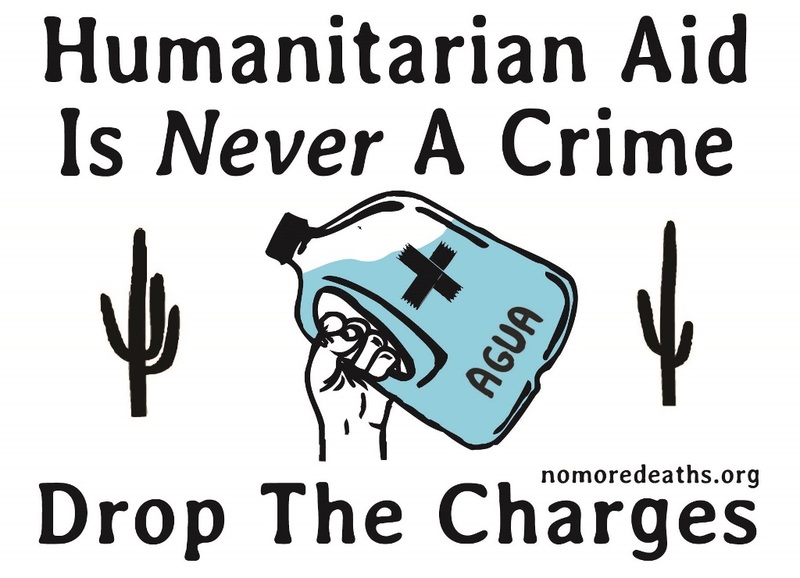 You might not know that nine humanitarian aid workers have been arrested for leaving bottles of water in the desert. Not just anywhere in any desert but in a harsh, unforgiving desert where over 300 bodies have been found in the past few years and many more suspected deaths unfound bodies. And along paths that aide workers suspect refugees might be traveling. No More Deaths - No Mas Muertes - has been working for years setting up humanitarian aid stations around this desert, seeking both live and dead bodies, as well as providing legal and medical aide to human beings. The nine people who were arrested were volunteers with No More Deaths. Four of them have been prosecuted and found guilty under tRump's amping up immigration policy to negatively impact volunteers as well as refugees. So most people - if they were home at all - took a sign or had me put one up in their yard. 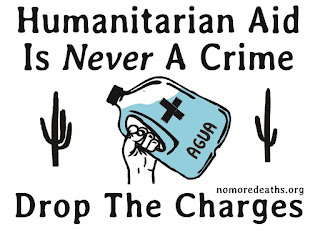 One white womon expressed her horror, eyes wide, shaking her head vigorously, when I told her No More Deaths volunteers had been arrested and convicted of leaving water in the desert and now face jail time and fines. But when I asked her if she'd like to put up a sign in her yard, she shook her head just as emphatically, smiled and stated she doesn't want a "political" sign in her yard. I said in jaded surprise "this is not political, it is humanitarian." "I'm not political" she claims broadening her smile. "Well" I say, "I guess that's amerikkkan then." without a smile. "In my opinon" I add hastily as she closes her front door. The only other negative interaction I had was with jehova witnesses, of all people. Maybe they felt threatened or thought I was competition. I asked one of the womxxn if she wanted a yard sign to take for her home. She smiled politely, shaking her head and said "no thank you".